Time passed so fast and since the inception of the blog more than 4 years ago, PROPCAFE have been covering property from North to South and East to West of Klang Valley. PROPCAFE was set up by 7 of us, with diverse background – from engineer to retiree and to student, with the diversity of our background we are offering multiple angles of our opinion in our reviews. The blog is serving as platform for collecting our thoughts of developments and share with readers. Some faithful readers have been with us for the past 4 years and with that we say a BIG thank you! Nevertheless PROPCAFE will strive to provide the best reviews and hopefully it will benefit the readers in broadening knowledge and in making property purchase decision. Back to the topic, it’s been almost one and half years since our last visit to IOI Resort City. 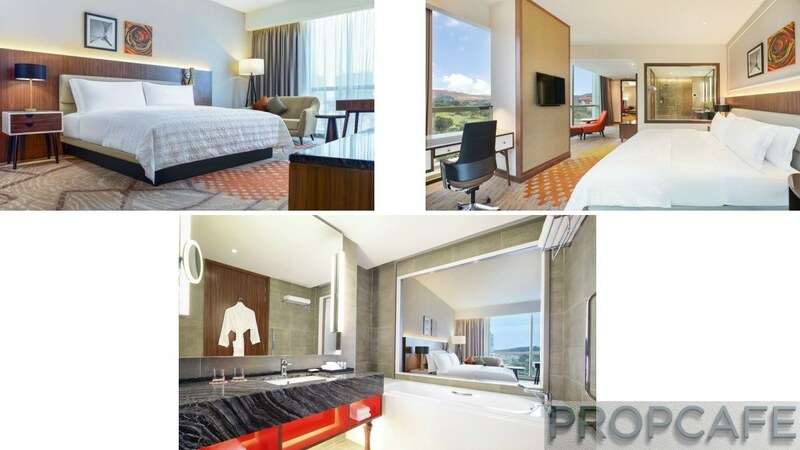 The last review was Conezion, an integrated retails-office-residential development where PROPCAFE focused the review on the residential component (Read the https://propcafe.net/conezion-ioi-resort-city-ioi-properties/). And IOI recently has premiered their Signature series in IOI Resort City called Par 3. Readers may ask what is Signature series? We will come back to that shortly. 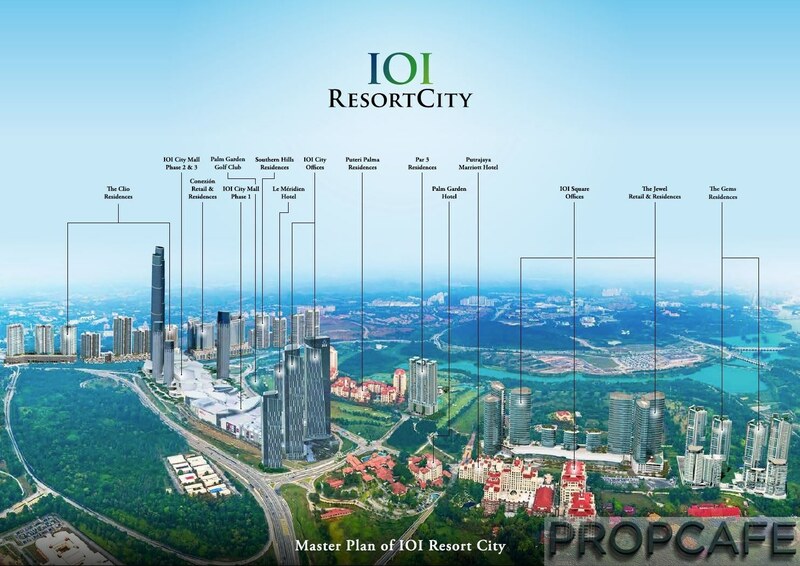 PROPCAFE has covered quite in-depth the masterplan of IOI Resort City and being a developing city, some of the components of the masterplan are streaming online even though it was just 1.5 years ago from PROPCAFE last review. For a start… the grade A 31 storeys IOI City twin towers have been completed and HSBC logo is majestically perched on the roof of one of the towers. The towers are MSC compliant offering 1million NLA with each floorplate is 16,500sqft, suitable for corporate tenant who are looking for spacious office space with connectivity and convenience of more than 250 specialty shops complemented by 80 restaurants and cafes at its doorstep@IOI City Mall to setup the business. A whopping 7,000 car parking bays, 12 nos of high speed lifts with destination control system, double volume 9.5m height lobby to greet office workers and guests. 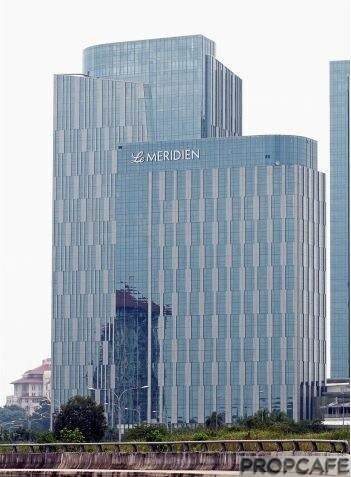 The 5 Star 21 storeys Le Meridien Putrajaya starts to receive guests from August.2016 and this is the brand’s 3rd hotel in Malaysia after KL Sentral and Kota Kinabalu. With 353 rooms and suites, 15 venues for meetings and conferences, a 2,500sqm function space, recreational facilities as well as wine-and-dine experiences with eateries Latest Recipe, Le Mei and the Latitude Bar, the hotel is doing well to complement the rest of IOI City resort components and to serve the leisure and business travellers. Wait… wait…. that’s not all… With IOI City Mall phase 1 which already hits 97% occupancy rate, the phase 2 is in the stage of conceptual planning (Refer to the link news here http://www.thesundaily.my/news/2136942 ) and the last visit to the Par 3 seems aside of the hoarding of the site, not much of work has been done on the land. However we were given the impression by SA that IOI will go ahead with phase 2 and piling work will start soon. 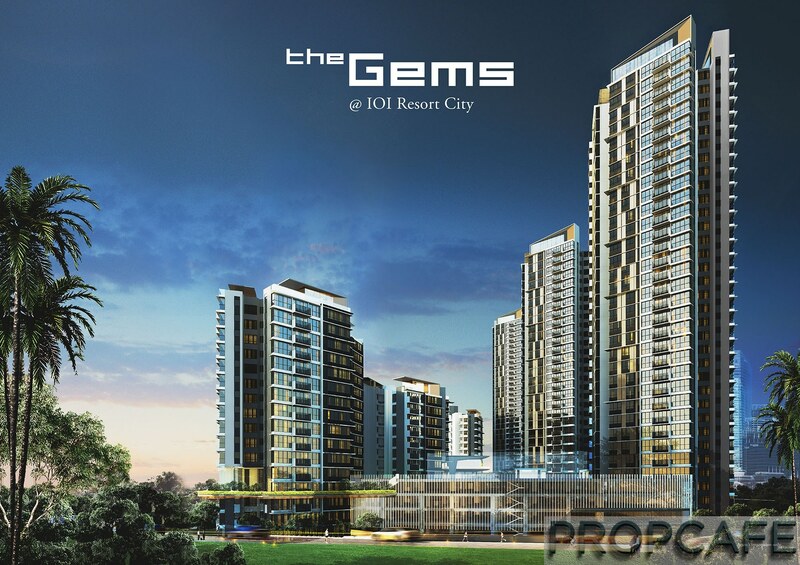 The phase 2 will cost IOI Properties RM500m development cost. 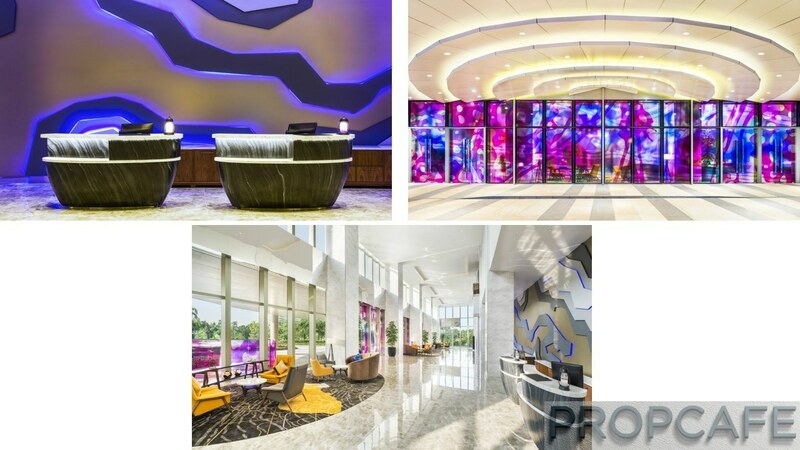 In the eyes of PROPCAFE, the completion of phase 2 will be a significant milestone for 788 acres IOI Resort City and IOI Properties. PROPCAFE shall touch fairly more in detailed in next chapter. 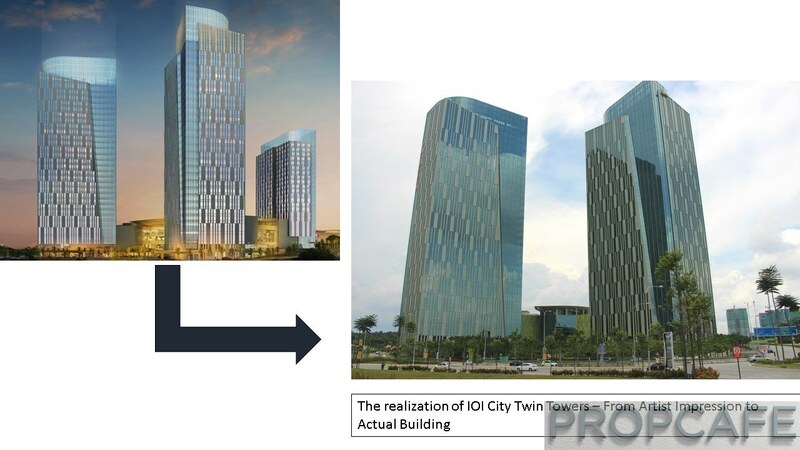 Not only that… From PROPCAE insider news, the delay on the finalisation of the Phase 2 conceptual planning is apparently due to some changes required by a particular retailer.. Something BIG may come to IOI City Mall. If what PROPCAFE heard was true, it is indeed something the residents are look forward to. Stay tune…. 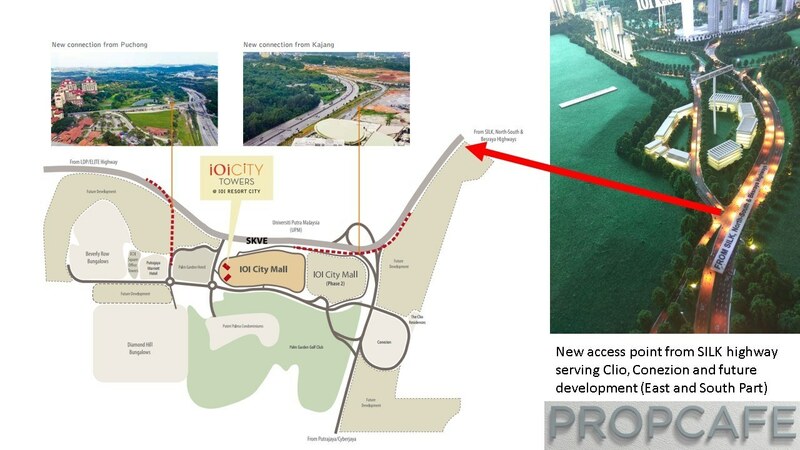 There will be another new access point which is not yet built where if you are coming from the direction of KL, Sungai Besi, Kajang and Semenyih through SILK, North South and Besraya Highways the new access point will bring you directly to Conezion, Clio and future development on Eastern and Southern parcels of IOI Resort City. The beauty of new township is there will always be something new to explore and with the JV between IOI and Mitsubishi Jisho Residences, another future development Gem residences which is sitting on a 9.6-acre freehold site, comprising eight blocks with units ranging from 1,250sqft to 1,750 sqft which will be another excited project coming to IOI Resort City. The Youtube in the link below pretty much visually sum up all about IOI Resort City. Regional Mall – Does It Matter? Retails outlook in Klang Valley cannot get bleaker than today. According to Savills Malaysia managing director Allan Soo, total retail space in Greater Kuala Lumpur will reach 70 million sqft by end-2018 — exceeding the supply in Singapore and most cities in Southeast Asia. The statistic on the retail outlook can be frightening and will raise red flag even among property players. PROPCAFE is always inundated with question about oversupply concern by our readers and we always advise to do own due diligence, buy at right price and location and always have an exit plan and then buying the property and will not go wrong. Do not get us wrong and we truly believe there are merits for the concern however PROPCAFE always believe in exception to the rules… There are myriad of factors which affect the popularity of malls e.g. lifestyle in Asia such as weather, shopping behaviour due to rising wealth, culture and social lifestyle etc. Malaysian is without exception…. Love our malls. With the amount of malls streaming online….. 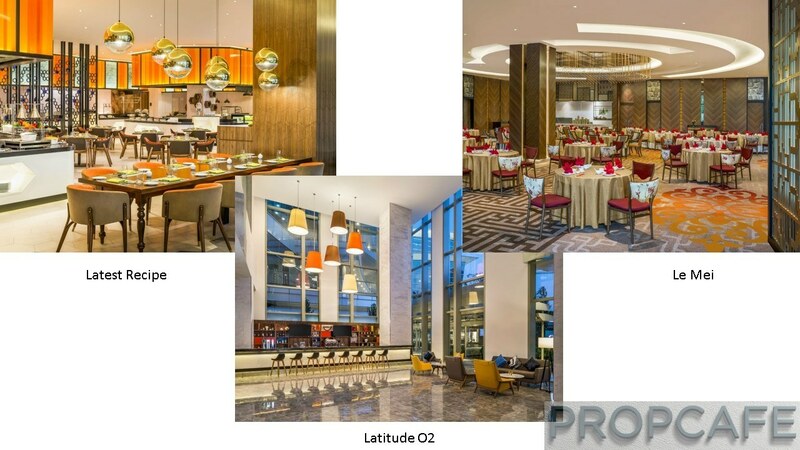 In PROPCAFE’s definition, distinctively there are three tiers of mall – neighbourhood, regional malls and regional mega malls where differentiated by size, targeted segments and catchment, location and PROPCAFE would like to add the infrastructure and amenities surrounding the mall as well. In Malaysia, a neighbourhood mall here is usually less than 500,000 sqft and serves as a market of within 15 minutes’ driving time. It is usually anchored by two or three major tenants including a supermarket, an entertainment area and a department store. The mix of variety such as pharmacies, fashion, F&B etc are catered for neighbourhood needs. The mall is typically standalone without integration with other components such as office, hotel, and convention halls etc as the targeted segments is from neighbour however a regional/ regional mega mall is different breed of animal. To ensure the regional mall is conveniently accessible, the developer will build a regional mall near to highways, public transport etc. What shoppers do not like is stucked in the traffic just to enter the mall and try to find empty carpark for 30minutes. Therefore shrewd developer who understand the market will invest significant of capital to build multiple access points to tap in the Qi (River Flow), with carpark entrances. The carpark must be sizable and plus point with office towers next door for example IOI City Mall and MidValley have back up carpark should the need arise. Successful malls are usually retained by developers in order to control tenant mix and ensure the mall is well maintained. If managed well with excellent footfalls, the mall can be a good source of recurrence income to the owner. 18 out of 20 largest malls in the world are located in Asia. 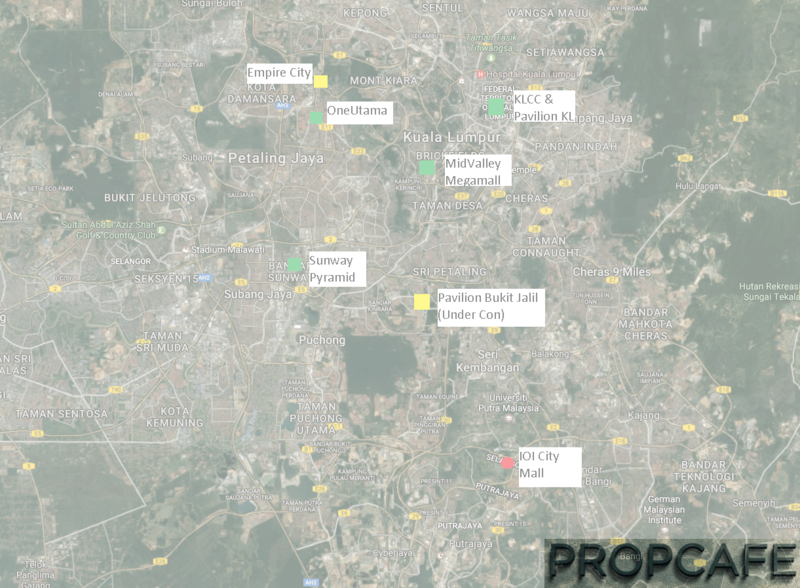 One Utama, Sunway Pyramids and Mid Valley Megamalls to name a few from Malaysia occupied among the spot. That is saying a lot about shoppers’ behaviour in Malaysia. What does this means? Whilst most neighbourhood malls are struggling to keep afloat with lower foot traffics and occupancy rates (https://www.themalaysianinsight.com/s/960/ ), regional & regional mega malls are thriving. It is also interested to note that despite 255 malls in Klang Valley, there are truly only few that can be considered as regional mega malls and when IOI City Mall Phase 2 completed, it will be on par with these malls. With 2.5m NLA, this will elevate IOI City Mall among the elite regional mega mall in Klang Valley, on par with more established mall such as One Utama, MidValley Megamall and Sunway Pyramid. 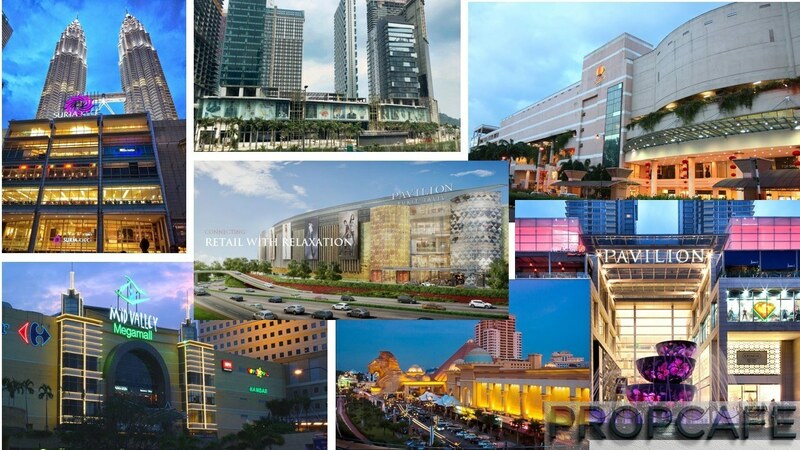 Not only that, IOI City Mall along Pavilion Bukit Jalil will be one of few upcoming regional malls with latest concept (check out district 21 review in the link https://propcafe.net/district-21-ioi-city-mall-putrajaya/ ). The other established regional malls are completed in late 1990s with some add-on expansion however the malls are slightly dated, without any innovative concept to meet the expectation of generation Y & Z. The Wikimapia shows IOI City Mall is the only one regional mall in southern part of Klang Valley serving more than 1.8million population within 20minutes drive. This is a plus point where most of the supplies of malls are concentrated in North and Central of Klang Valley. 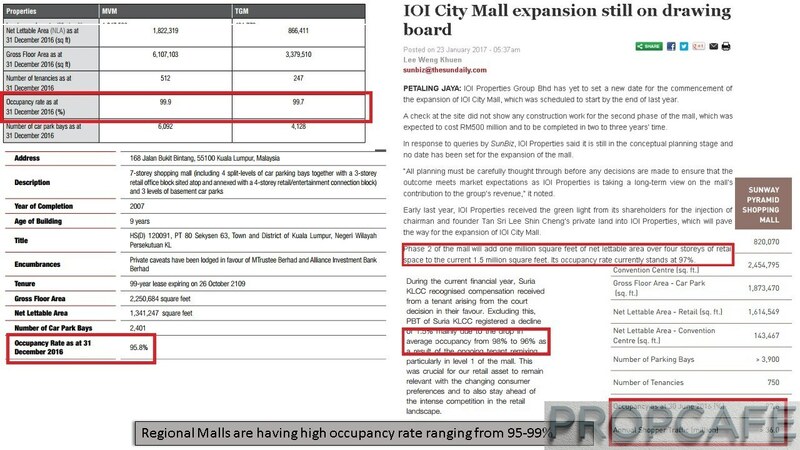 With developments in Semenyih, Bangi, Cyberjaya, Dengkil etc are gaining traction and without any regional mall planned in South KV, the IOI City Mall will only be serving more future population without any direct competitors. Whilst the average occupancy rate of malls were struggling at 79.9% in 2016, the occupancy of the regional malls are showing resilience with more than 95% occupancy rate. End of the day, we need to separate a wheat from a chaff. Just because the overall market is sluggish it never meant the premier players will be significantly affected as these players are usually a league above the rest. Developments that are integrated with malls are gaining popularity for the past few years due to purchasers are attracted to the convenience of the mall and impression the mall is giving extra value to the property. However most developers are without hardware and software experience as well as lack of investment to develop a successful mall. Usually developers will put hefty premium to the properties, however they lack the commitment to ensure the success and sustainability of the mall which remains a question mark. PROPCAFE couldn’t help but notice most of times a mall is just used as gimmick. Nevertheless, a truly sustainable and successful mall is rare and a limited edition and in the case of regional mega malls… even rarer. In PROPCAFE, we are quite excited and look forward to IOI City Mall expansion plan coming to fruition and PROPCAFE is confident the residents especially from Conezion, Clio, Puteri Palma and newly launch like Par 3 and future launch (Gem Residences) will immensely benefit from its proximity and piggyback on the infrastructure of IOI City mall and enjoy the conveniences and capital appreciation wise. 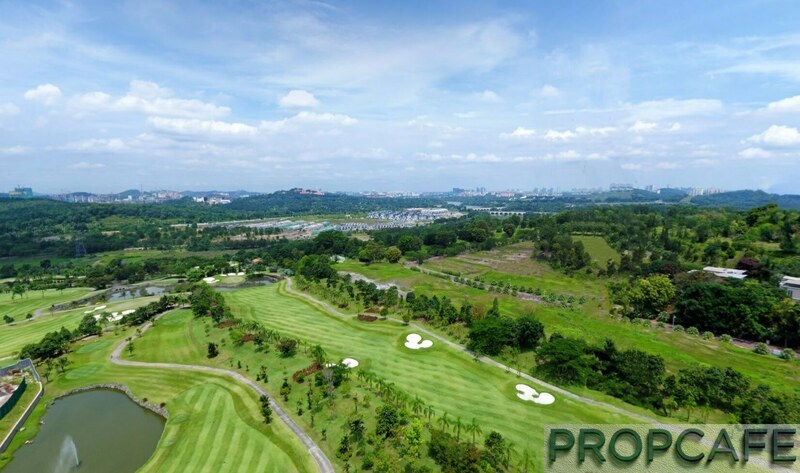 There are a wide range of golf course available in Klang Valley. In the past, golf used to be a sport played by elite and VIP and access and usage of the golf course and clubhouse are only restricted to the members to maintain exclusivity. However this is no longer the case. The passionate golfers can use a number of public golf courses by paying the green fee. There are more than 20 golf courses in the Klang Valley. Some of the courses are exclusively for members and few are available to public. 18-holes Palm Garden Golf Course is one of the public golf course. What the golf course offers is the tranquillity and greenery of the township. Rather than maximising profit by building a concrete jungle, the golf course is excellent addition as one of the components of IOI Resort City. Residents will appreciate the fresh air, morning mist and the greenery greeting you when you return from work when you live within the 330 acres of lush greenery. These townships are well known to be highly in demand and popular among affluent house seekers who are looking for a home. In fact the properties in these townships are known having a good capital appreciation due to low density environment, greenery and exclusivity. 330 acres out of 788acres works out to be a whopping 40% in IOI Resort City is set aside as recreation, green area and golf course and indeed it is a very generous gesture by IOI Properties. PROPCAFE in next review will share the 360 degree panoramic view of greenery and golf course. However whether the developer will keep their commitment in the future at this prized landbank…. It will be a question to be answered in another day. Not only that, Palm Garden Golf Club was voted Malaysia’s top three ‘BEST GREENS’ for the second consecutive year by “ParGolf”. In our next PROPCAFE review – Par 3, we shall share more the majestic view of the Palm Garden Golf Course and what it feels living surrounded by tranquillity. It is all about the components work in an ecosystems that make a clock ticks. Similarly when you buy a home, it is not always just about the house but it is about the neighbourhood, amenities and infrastructure, conveniences and of course greenery and recreation within the township. It seems that missing component is international and public school from the masterplan. Perhaps IOI Properties can look into this to provide holistic living environment to residents in the township. 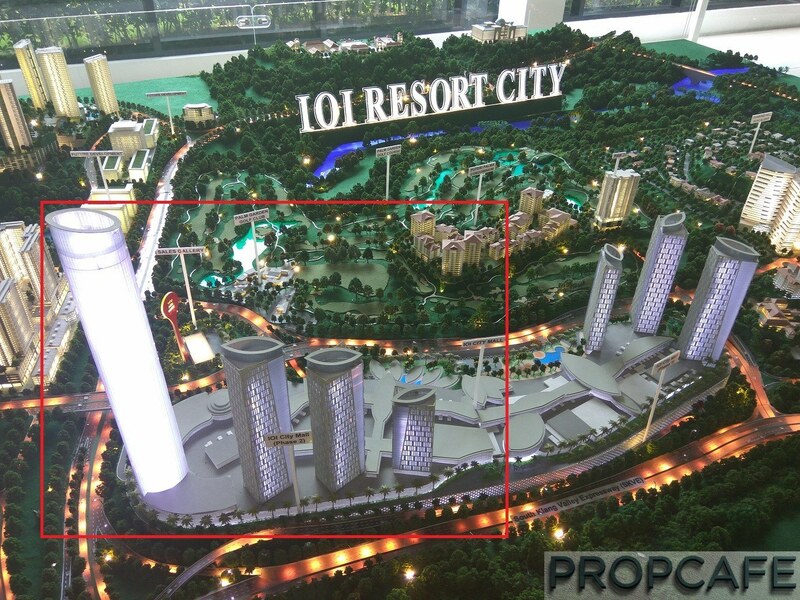 Nevertheless, PROPCAFE think IOI Resort City has been low profile unlike other developers who keep advertise their developments on weekly basis.